Almost a year after the first libfocus blog post, we revisit The Atlas of New Librarianship. 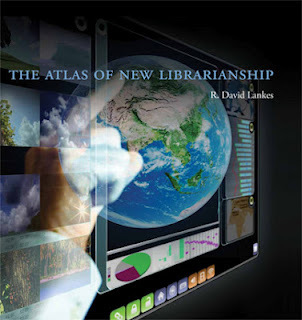 Seldom has a book been named so aptly; Lankes' Atlas of New Librarianship looks and feels far more like a coffee table hardback designed for casual browsing than a professional monograph. Whilst this approach suits the wealth of visual material (and yes, there are 'maps' aplenty! ), it does take a while to adjust to its unusual shape and format for the purpose of extended reading (and even at that, never really feels comfortable). Design issues aside, the Atlas is certainly a book that makes you stop and think. Lankes has some ideas which will splinter the comfort zone of many librarians, but whether you agree with him or not, it is impossible not to be impressed by the ambition and passion that seeps through the pages. It primarily sets out to help librarians navigate the future and deal with the challenges inherent in such a changing profession - the key word here being librarians rather than libraries. Throughout, Lankes emphasises that many of the traditional library services that are often perceived as core functions or services (books, other collections, physical spaces) are nothing more than tools that can change or disappear at any time. In contrast, New Librarianship is driven by the core mission of facilitating the creation of knowledge by connecting people and building communities, and the librarian - not the library - is central to this. Lankes largely views this idea through a theoretical rather than a practical lens which can be difficult to plough through at times, and illustrations are often plucked exclusively from the public library setting. For instance, Lankes believes that the "prime value" of librarians is not their skill sets or credentials but rather their credibility, an argument that I would largely disagree with given the increasingly technical nature of many roles, particularly in the academic and special library sectors. Notwithstanding this, there are certainly many interesting arguments and ideas contained within the Atlas, but these are often at risk of being drowned out by Lankes' theoretical detail. The over-reliance on the complex diagrams or 'maps' is also a little distracting at times, and in many cases I find myself asking if they are really all that necessary. Although aimed at practitioners, most of the time it reads more like an MLIS textbook. If you are looking for a checklist or toolkit of practical action points to bring to your daily work, then The Atlas is probably not for you, but to be fair to Lankes this is not really the purpose of the book. Instead, it seems that the author is trying to initiate a broader theoretical and philosophical conversation about the values and theories which inform and underpin librarianship. As such, it presents its case in a very thorough and detailed way, but the sheer volume of material often makes it feel like a guidebook to a tiring, long-distance voyage rather than an enjoyable trip. A streamlined companion book could work very well, though the author may feel that this would destroy the very essence of the 'Atlas' concept. In Lankes' case however, I really do think that less may well have been more. The Atlas of New Librarianship is published by MIT Press. Visit R David Lankes' website to accompany the book. Post-Publication Peer Review: Where are we at?